Standard formalin preserved starfish. Available in vacuum packs or pails. Starfish, Asterias sp., make great introductory dissection specimens. 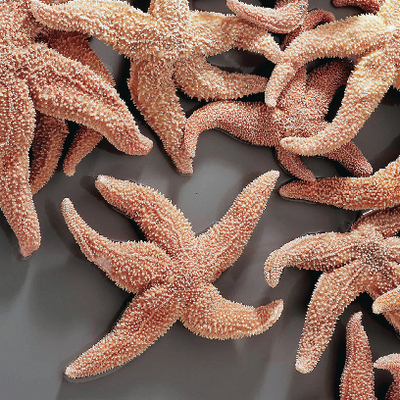 Commonly featured in text books, starfish specimens are great for studying external anatomy or for use in dissection. Availability Limited: due to an outbreak of sea star wasting disease on the natural population of star fish, supplies are currently limited. Future availability is currently unknown; however, we are working on restoring stock as the natural populations continue to grow.